It’s interesting how inflation can be a killer. The 2008 high of the Nifty was 50% lower than the highs in Jan 2018. And yet, because of inflation, the high then was more valuable than the high today. See how Rs. 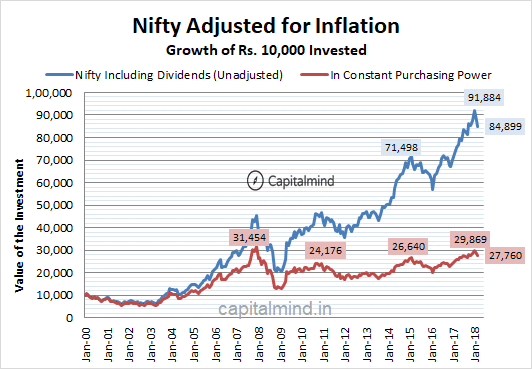 10,000 invested in the Nifty (with dividends reinvested) would have done in absolute terms (85,000 since year 2000) and then, we adjust it downwards for inflation for constant purchasing power. Effectively, while the Nifty’s much higher, your money today buys you a lot lesser than the same thing in 2008. High inflation can be a killer for investors over the long term – and it’s only now that inflation’s coming under control. A lot of “growth” has perhaps been in the smaller and mid cap stocks – but the Nifty itself has struggled to beat inflation.